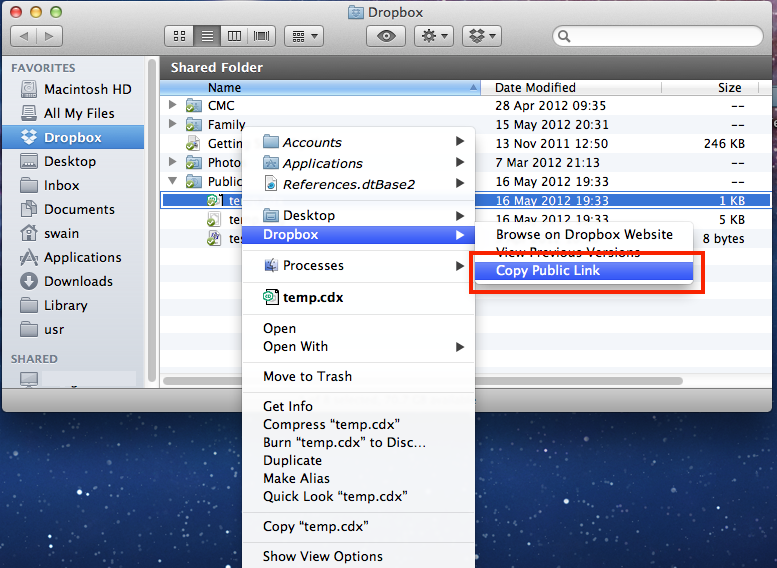 Copy File to Dropbox Folder and Create email message containing link. A while back I posted a script that copied a file to a users MobilMe Public folder and created an email link to that file. With the imminent demise of MobileMe a couple of people have asked me for a script that does the same but uses Dropbox. I thought the easiest way to demonstrate this was to modify the previous script used to email chemical structures. Where “12333897” will be replaced by your unique identifier and we can create a URL in this format to any new file saved in the Dropbox Public folder. The first part of the script creates the path to the Dropbox Public folder, this will be used by the script to save the file in the correct place. set target_path to target_path & "Dropbox:Public:"
We then construct the URL, you will need to replace the “yourID” with your unique identifier. set filePath to "https://dl.getdropbox.com/u/yourID/“ & "temp.cdx"
We then tell ChemBioDraw to save the frontmost document to the Dropbox Folder in both CDX and PNG format. I’ve started to modify the scripting of ChemBioDraw, instead of calling the application by name which means we need different versions of the script for the “Std”, “Pro” and “Ultra” versions of ChemBioDraw. tell application "CS ChemBioDraw Ultra"
Which I hope will mean that we only need one version of the script, let me know how this works. The remainder of the script is similar to the previous one, except that we embed a URL into the body of the main message. set png_file to target_path & "temp.png"
set cdx_file to target_path & "temp.cdx"
save first document in (pngAttachment) as "PNG"
save first document in (cdxAttachment) as "ChemDraw"
You can download the script from here mailDropbox.scpt.zip remember you will need to edit the script to insert your unique Dropbox identifier.